We got a package today.....all the way from the UK! Louis and Dexter, two adventurous schnauzers asked for summer pictures. We sent one at our 'beach'. And we were finalists. We didn't win, but look at the fantastic picture they made for us! Isn't it wonderful? Thank you Dexter and Louis (and your Personal Assistant)! We're going to put the picture on the wall next to our computer. Also thanks to those of you who voted for us, too. A new breed of dog! Sometimes she walks about 4 steps and rolls. Shakes, walks 4 more steps and rolls. ....takes ages to get across the field. ....tormenting the dogs next door. I'm very quiet and they make loads of noise and get in trouble! to play 'let me in/let me out'! I can play ALL day long. It rained all week. SHE disappeared every day and came home smelling of children....yuck. 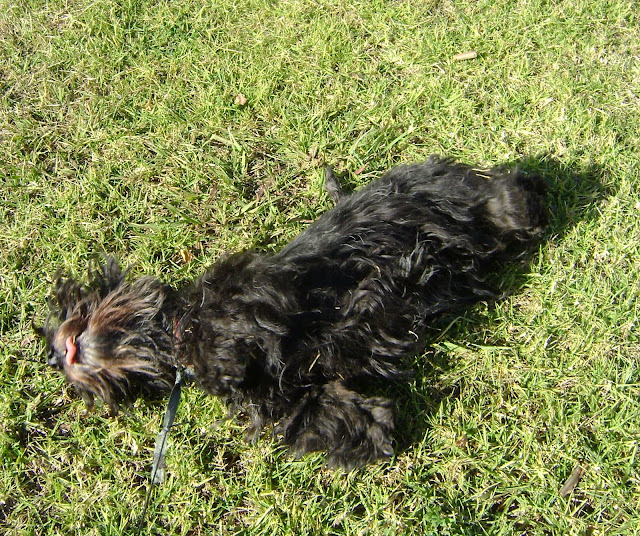 We've had hardly any walks. Only short ones. This afternoon, the sun came out. When SHE came home, we had dinner put on our collars and leads and packed into the car. Great excitement. Were we going to the river? Duckpond? Millie's? NO, we went to the V-E-T-S! It was time for our annual check ups and needles. What a disappointment! 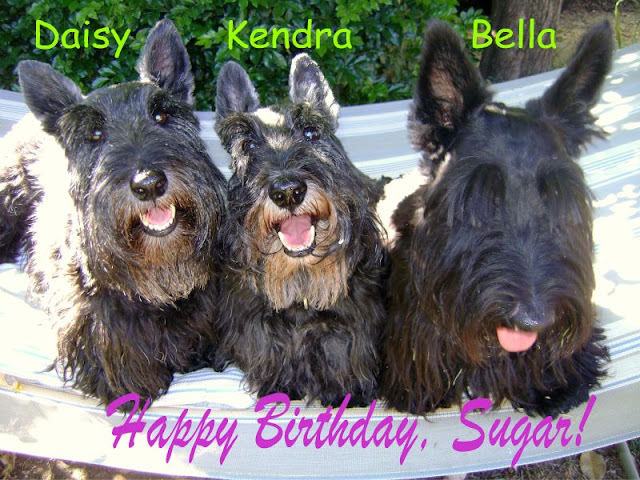 (We stole borrowed this from The Scottish Terrier News...but it doesn't have a scottie response.) Hope you enjoy it. Golden Retriever: The sun is shining, the day is young, we've got our whole lives ahead of us, and you're inside worrying about a burned-out bulb. Border Collie: Just one, and then I'll replace any wiring that's not up to code. Dachshund: You know I can't reach that ***** stupid lamp. Lab: Oh, me, me!!! Pleeeeeze let me change the light bulb! Can I? Can I? Huh? Huh? Siberian Husky: Let the Border Collie do it. You can feed me while he's busy. Cocker Spaniel: Why change it? I can still pee on the carpet in the drk. Old English Sheep Dog: Light bulb? I'm sorry, but I don't see a light bulb. German Shepherd: Alright, everyone stop where you are! Who busted the light? I SAID, 'STOP WHERE YOU ARE!!!" Cat: Dogs do not change light bulbs. People change light bulbs. So the question is: How long will it be before I can expect light? Us, because it's our blog. So what do you think.....are the answers accurate? Bella working out how to eat a pig's ear without taking her eyes off the television! She is still adicted to the telly. We had NO WALK on Friday....you read that right...NO WALK! SHE had to drive 5 hours to Sydney for a 45 minute doctor's appointment and 5 hours back. (One of the delights of living in the middle of nowhere). Then SHE went out to dinner with friends and abandoned us again! So Saturday morning we got HER up very early and stuck to HER like velcro until walk time. Kendra chose not to come. She just watched us get ready and disappeared into the bushes. We had rain during the week. That made Bella happy. She loves puddles. Jake was already down by the river by the time we got there. Bella and Jake went for a paddle until the rest of the gang arrived. Max, Fred, Jake and Buddy (in front) Flash is missing. Fred was last to arrive this week. fantastic time! Bella got trodden on at one point, but she got up and raced on. Those boys play wild games. We always have lots of time to sniff around. And it's definitely worth putting up with the bath. 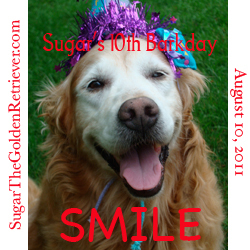 Today, the 10th of August is Sugar's 10th Barkday! She is a very smiley Golden Revriever. To celebrate her birthday, she has asked for lots of smiley faces. These were sent to us in an e-mail. Hope they start your week with some smiles. We finally got some rain today....good for the farmers, but not appreciated by three scotties who only got ONE SHORT walk in the reserve across the street! But we have some pictures taken at our friend Millie's during the week when we had beautiful days. As you know, Millie is a wild, in-your-face doxi. She never seems to tire and doesn't pant much. Look closely. Can you see Millie? Come on ya wimps...I'll take on all three of you! She just goes and goes and goes! We love Millie. (Because it was an indoor day today, Bella watched 'Rain Man' and some cooking shows.